Last week we had a short break away in South Wales. The weather was just wonderful and we spent most of the time on the beach. The beach was especially beautiful in the evening and it was nice to relax and watch the kids having such fun on the sand and in the water. They were made for the seaside. 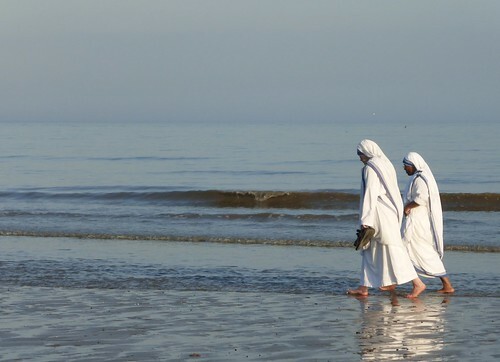 I took lots of pictures of everyone but tonight I am going to show you this random one of some nuns going for an evening stroll along the sand. When I saw these women I just knew this would make a fascinating photo and I think it really did. And I have not edited the colour in any way. Isn't that evening light just stunning?